The Qi Heritage Museum (齐文化博物院) is located in Linzi (临淄) in China’s coastal province of Shandong (山东省). Linzi was the capital city of the ancient State of Qi (1046 BC – 221 BC). In celebration of the Qi Culture Festival, there is a new exhibition of ancient Chinese money at the museum. According to a newspaper article, the exhibit includes unearthed specimens which have never been shown to the public before including hollow handled spade money from the Spring and Autumn Period, perfectly preserved “money trees“, coin moulds, and “Peace under heaven” palace coins. Unfortunately, the newspaper article does not include any photographs. The museum’s website provides some images but no close-ups of the coins. The vast majority of Chinese coin collectors outside of China have no choice but to rely on black and white rubbings in coin catalogs to determine the authenticity of rare coins. Many collectors put faith into images they see at internet auction sites which are well known to include many fake coins. Images from coin dealers, coin forums and personal websites can also include coins of questionable authenticity. While searching the web, however, I came across a blog article from a Chinese visitor at a previous coin exhibit at the museum. 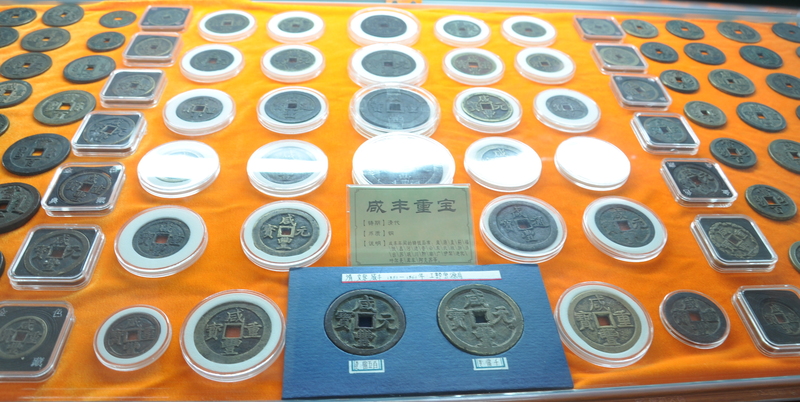 The blogger admits that he is not a coin collector but, fortunately, he took some photographs which document part of the extensive collection of ancient Chinese coins at the museum. Clicking on the images below will bring up a larger image. By clicking the image again, an even larger and more detailed image will appear. Use your scroll bars to move around the display case. In this way, you will have the opportunity to clearly see the color of the patina, calligraphy, metal type, size, etc. of many rare Chinese coins. The museum has a vast and extensive collection of ancient Chinese money from the late Zhou and Warring States Period, perhaps the best in the world. This is due to the museum being located in the area where many of the ancient Chinese states were situated. 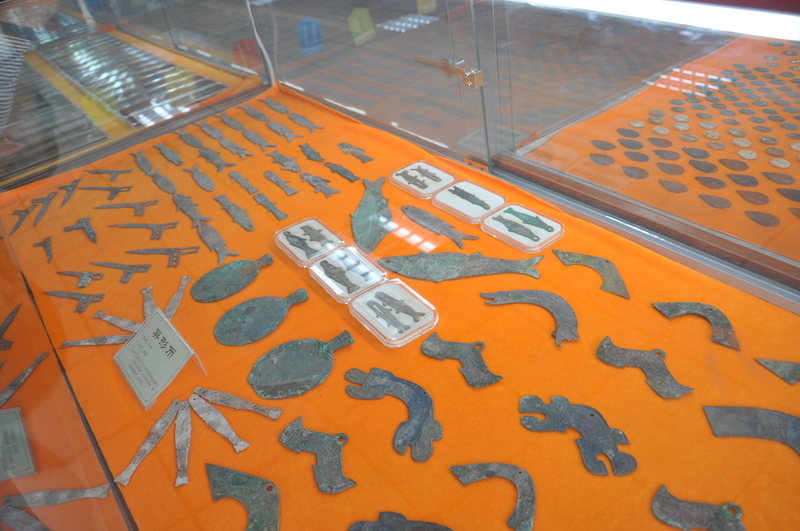 Most of the collection of ancient coins came directly from archaeological digs in the area. This exhibition case includes specimens of what may be very early forms of money from the Zhou Dynasty (1046 BC – 256 BC). 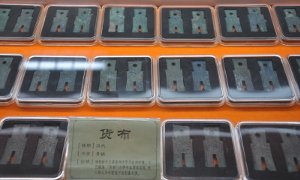 No historical sources from this time period mention these objects so there is some question as to whether they are, in fact, ancient Chinese money forms. They are usually referred to as “pseudo money” or “odd shaped money” (异形币). Based on their shape, they are “fish money” (yu bi 鱼币), “halberd money” (ji bi 戟币) and “bridge money” (qiao bi 桥币). Some specimens of “bridge money” are referred to as “tiger head bridge money” or “dragon head bridge money”. For a much larger and more detailed view, please click the image. The museum is located near the capital of the ancient State of Qi (齐国) which existed from 400 BC to 220 BC during the Warring States Period (战国时代 475 BC – 221 BC). 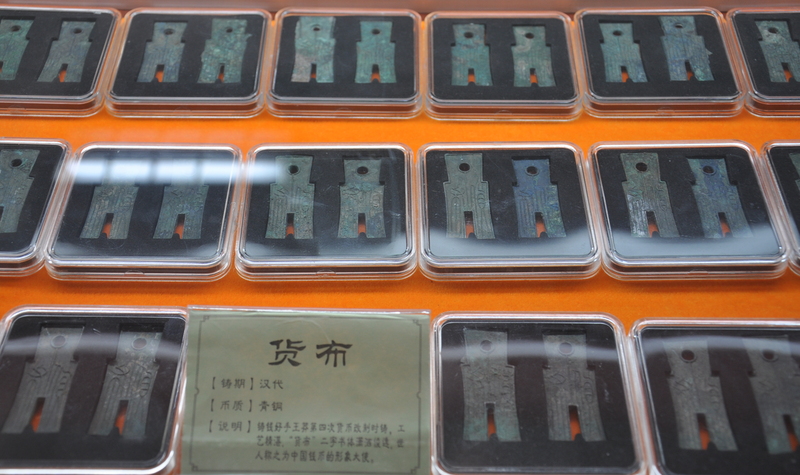 Qi was one of the states that used a form of money made of bronze and in the shape of a knife (dao bi 刀币). The Qi Knife Money evolved from an ancient bronze implement with a ring at the end. This knife was known as a xue (削). An image of an ancient xue may be seen here. Although in the shape of a knife, the Qi Knives were never actually used as knives. The earliest form of knife money circulated in Qi and later spread to the States of Yan and Zhao. 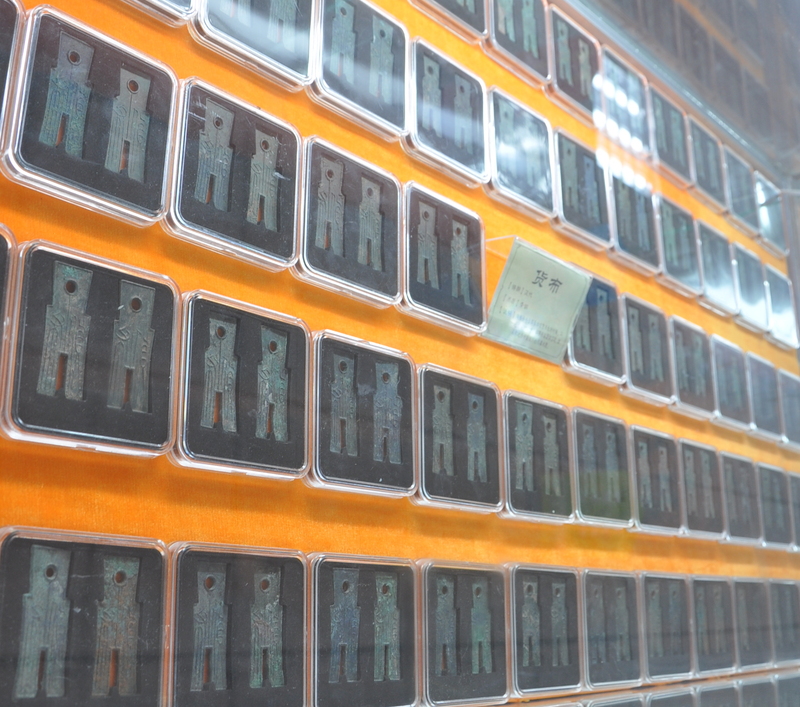 As a result of the many archaeological excavations in the area, the museum has the finest collection of Qi knife (qi dao 齐刀) money in the world. Qi Knives have three, four, five or six Chinese characters on their obverse side. The reverse sides can have one or more characters or symbols. 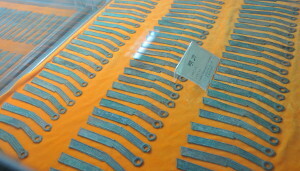 Some of the museum’s Three Character Knives (三字刀), bearing the inscription qi fa hua (齐法化) meaning “Qi Legal Money”, are seen in this image. For a more detailed view, please click the image. 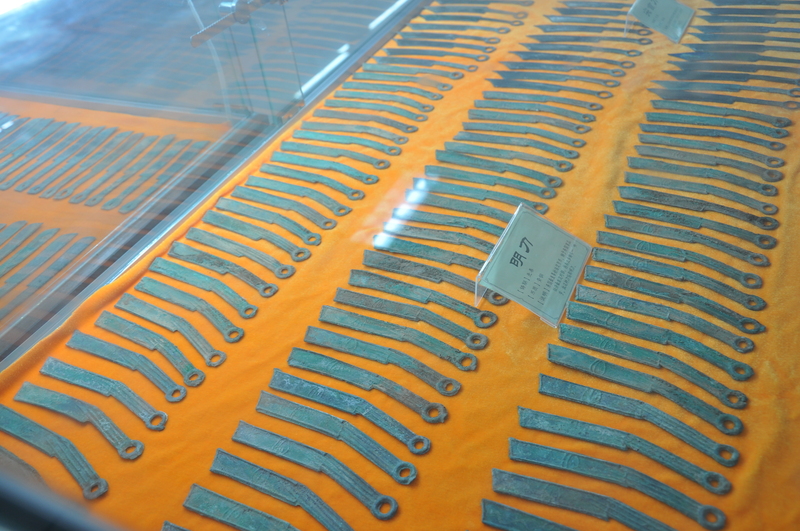 The museum also has a collection of Four Character (四字刀), Five Character (五字刀) and Six Character knives (六字刀) from the State of Qi. 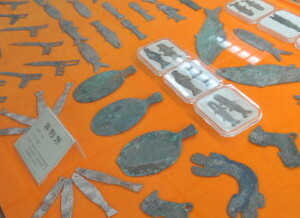 The image at the left shows some of the extensive collection of Five Character Knife (五字刀) money. Please click the image for an expanded view. Five Character Knives have been found with two different inscriptions. One inscription is ji mo zhi fa hua (即墨之法化) which translates as “Ji Mo Legal Money”. Jimo (即墨) was situated in what is now Pingdu in Shandong Province. The other inscription is an yang zhi fa hua (安阳之法化) which translates as “An Yang Legal Money”. Anyang (安阳) was situated east of what is now Caoxian County in Shandong Province. 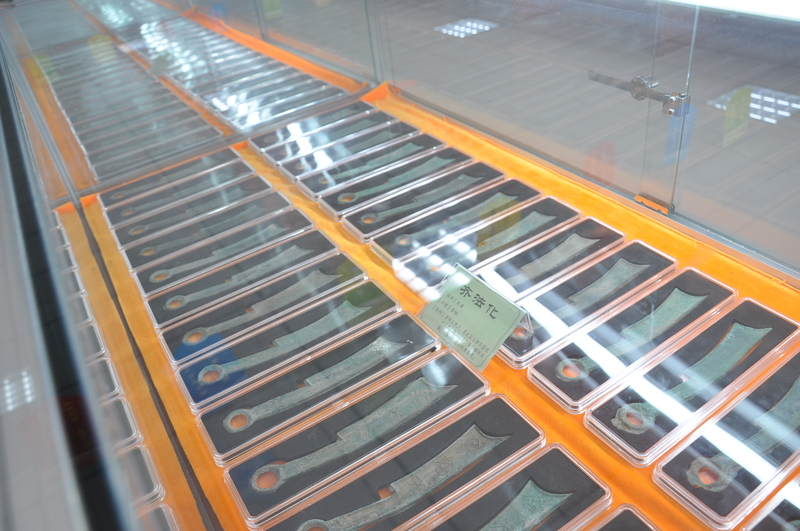 At the left is another view of the Five Character Knife showcase. Clicking the image will bring up a larger view. Both the An Yang (安阳) and Ji Mo (即墨) varieties of the Five Character Knife can be seen in this image. 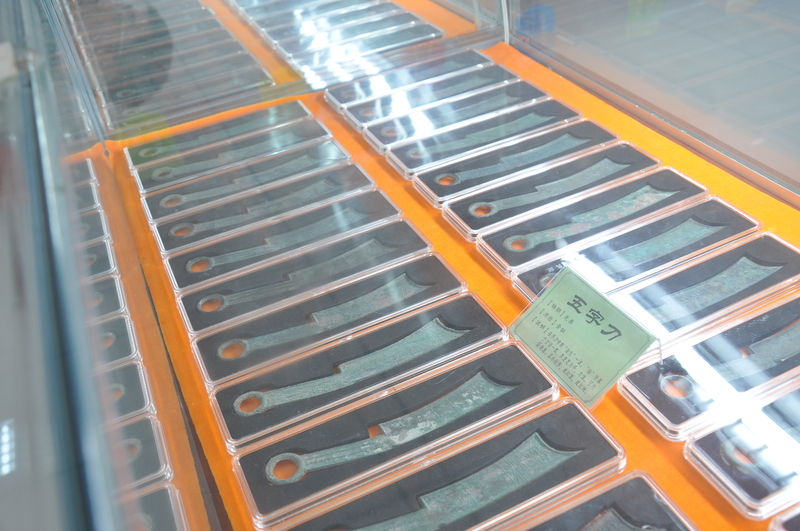 Unfortunately, the blogger did not publish images of the museum’s collection of Six Character Knives (六字刀). 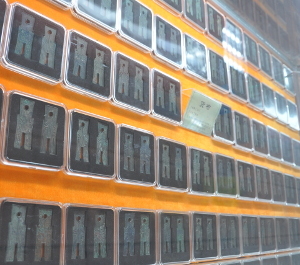 The Six Character Knives were minted in what is now Linzi in Shandong Province. 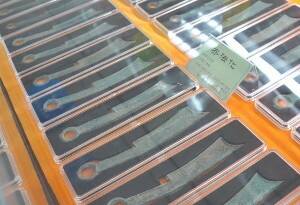 Pointed Tip Knives (jian shou dao 尖首刀) from the State of Yan, as well as Straight Knives (zhi dao 直刀) from the State of Zhao (赵国), are displayed in this case. Clicking on the image will provide a better view. 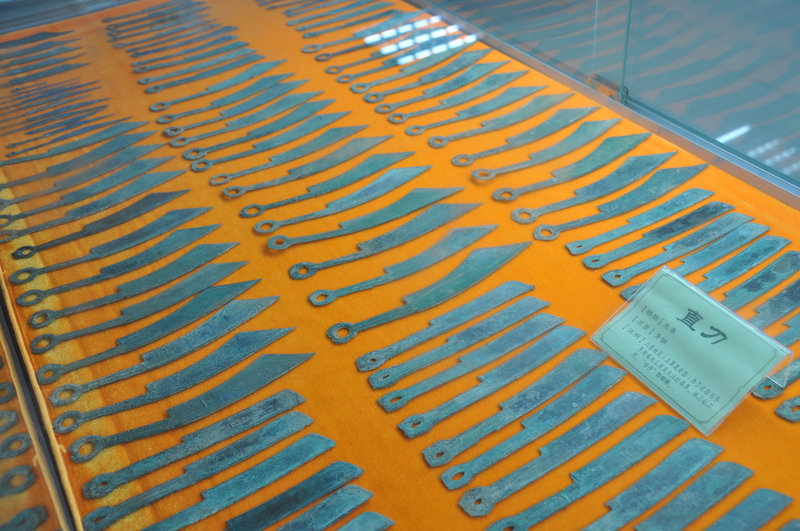 The museum has a large collection of Ming Knives (ming dao 明刀) from the State of Yan (燕). This type of knife money is known as “Ming Knives” because the character on the obverse side is believed to the the Chinese character ming (明). For some reason, the museum decided to display all the Ming Knives with the obverse side (明) showing which is the same for all the knives. Showing the reverse sides would have been preferable since the reverse sides display a great variety of inscriptions. Please click the image for a closer view. The Chinese blogger provides images from several other exhibition cases. The showcase at the left displays huo bu (货布) cast 14 AD – 23 AD during the reign of Wang Mang (王莽) of the Xin Dynasty (新朝). Wang Mang carried out four major reforms of the monetary system which included a total of 37 kinds of money. This created unprecedented chaos and misery. To his credit, many of these money forms attained very high artistic merit. A close-up of the museum’s collection of huo bu may be seen by clicking the image. 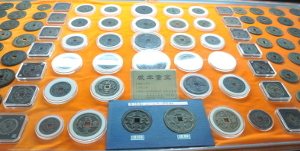 This is another view of the museum’s extensive collection of huo bu coins. Please click the image for a close-up view. The huo bu is derived from an even more ancient form of money in the shape of a spade. For more information concerning spade money (bubi 布币) and huo bu please see Chinese Spade Charms. A charm based on the huo bu is discussed in the article Huo Bu Charm. The Song Dynasty (960-1279) is noted for casting cash coins with beautiful calligraphy. One of the most famous coins is the da guan tong bao (大观通宝) cast during the years 1107-1110 of the reign of Emperor Huizong of the Northern Song. The calligraphy on the coin was done by Emperor Huizong himself in a style known as “Slender Gold” script (shou ji ti 瘦金体 or tie xian shu 铁线书). 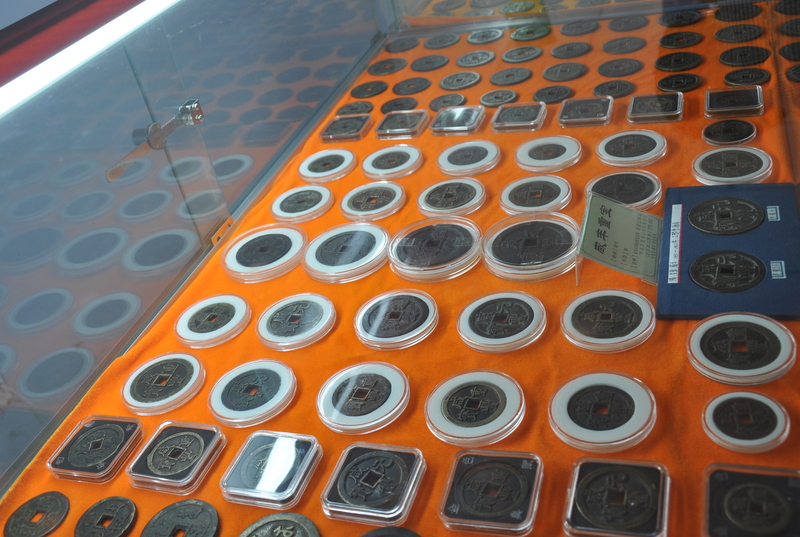 The museum has a large collection of these da guan tong bao coins as can be seen in the display above. An enlarged view may be seen by clicking the image. 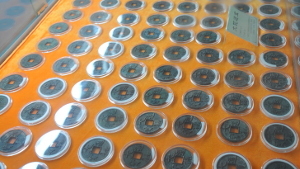 At the left is a different view of the da guan tong bao coins. Please click the image for a better view. 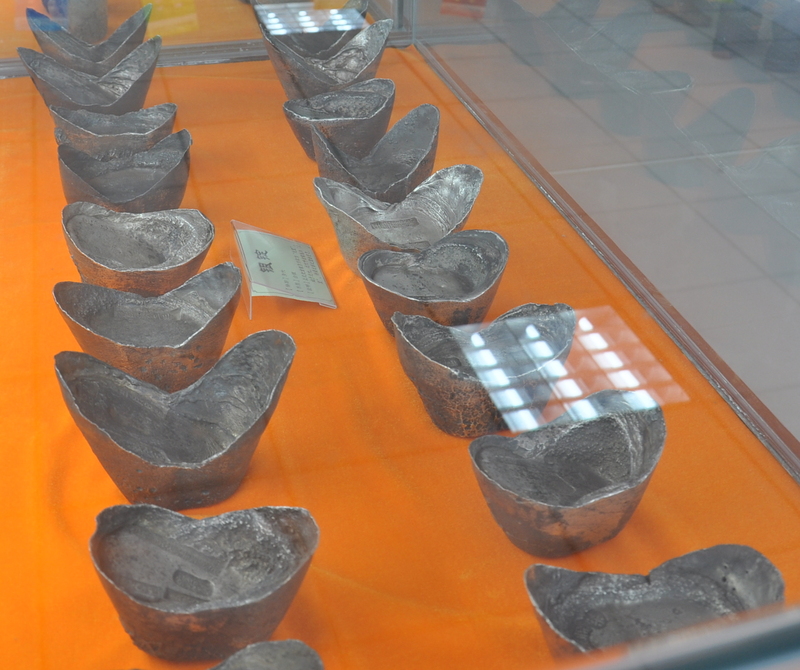 The museum has a large collection of Chinese sycee (xi si 细丝) which are also referred to as yuan bao (元宝). The sycee was a form of silver currency made into various shapes. They circulated as a form of money as early as the Spring and Autumn and the Warring States Periods. Their value was determined by their weight. Sycee were usually made by silversmiths instead of official mints. Their value was determined by their weight. Moneyhandlers known as shroffs would determine the purity and weight in taels (liang 两). The image at the left shows one of the sycee display cases. Sycee are often categorized by their shape. The specimens in this case are known as boat sycee (ma di yin 马蹄银). For a very detailed view, please click the image. 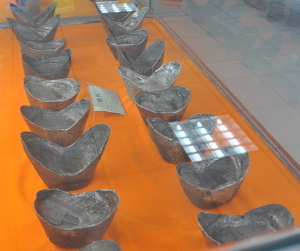 At the left is another display case exhibiting a collection of round sycee (yuan ding 圆锭). Please click the image for a close-up view of the display. This case displays a different type of sycee. 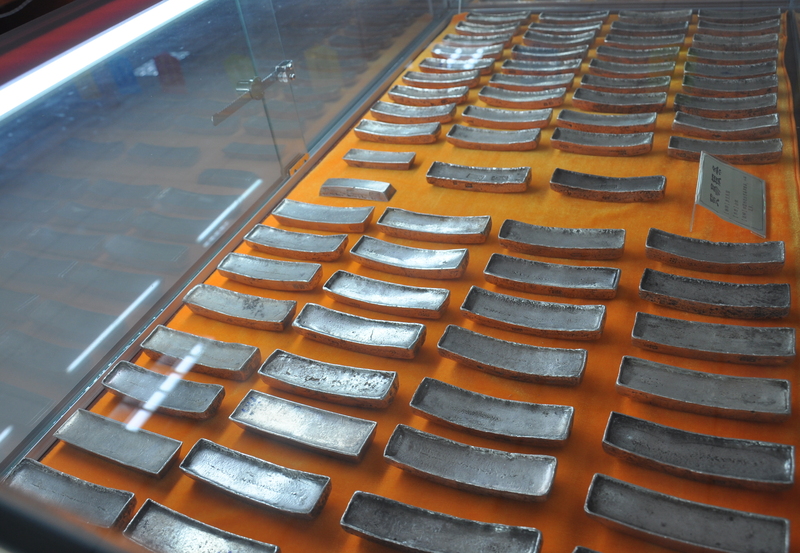 The sign in the showcase states that these are “trade silver bars” (mao yi yin tiao 贸易银条). The final images show a display of coins cast during the reign (1851-1861) of the Xianfeng Emperor of the Qing Dynasty (1644-1911). 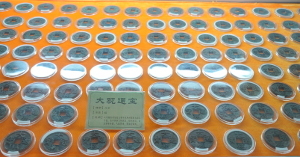 Because of huge military expenses needed to suppress the Taiping Rebellion, a great variety of large denomination cash coins were cast during the reign of the Xianfeng Emperor. 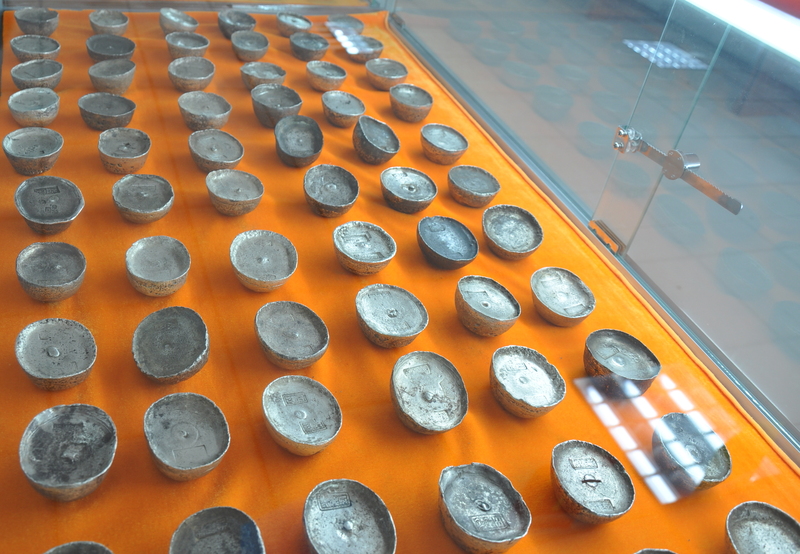 The small cash coins cast by Xianfeng are called tong bao (通宝). Coins with a value of four to fifty cash are called zhong bao (重宝). Coins with a value of one hundred to one thousand cash are called yuan bao (元宝). 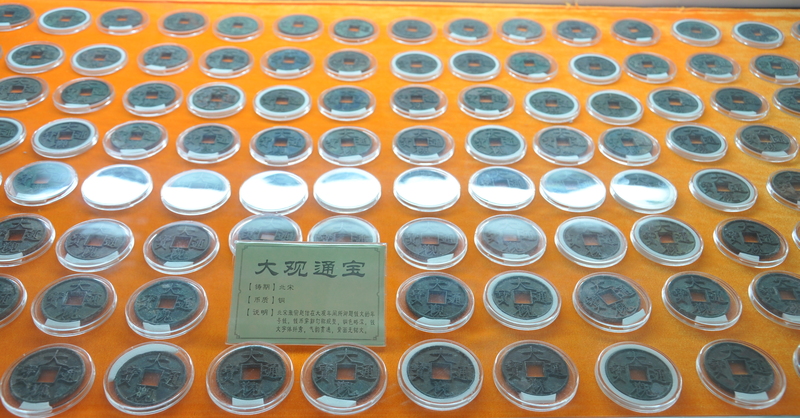 The display sign states that the coins in the case are zhong bao. 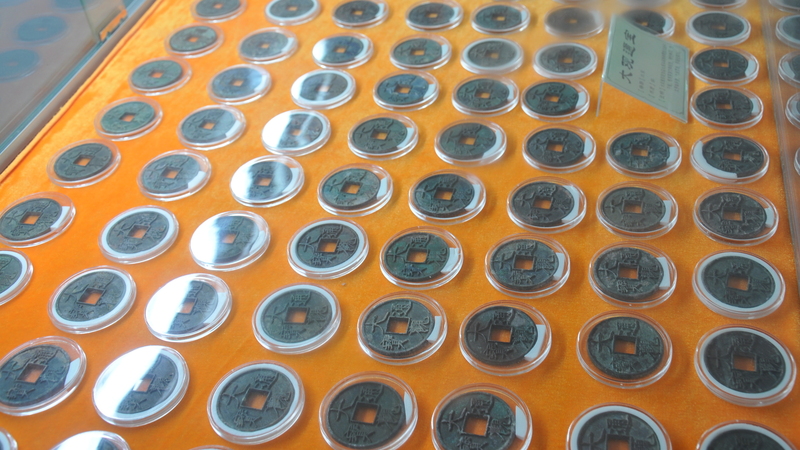 However, if you click the image and view the coins close up you will see that the case also includes yuan bao coins. This is another view of the coins cast during the reign of the Xianfeng Emperor. It is fortunate that the Chinese blogger decided to publish his personal photographs of some of the collection at the Qi Heritage Museum. In so doing, he has provided collectors around the world the opportunity to clearly see authentic specimens of some of China’s rarest ancient coins.